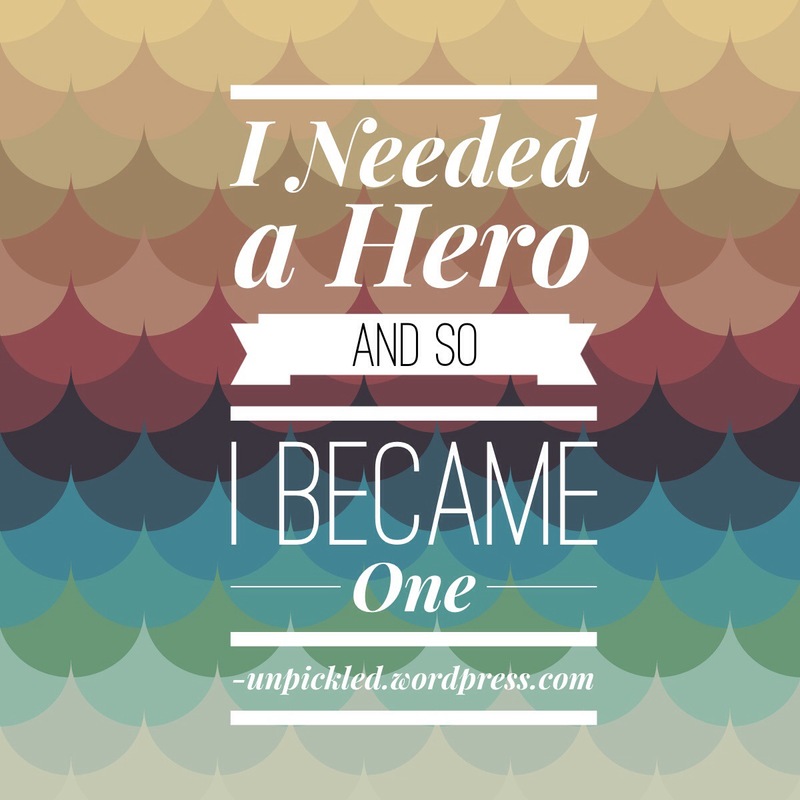 Are You A Recovery Hero? You may remember your old high-school English lessons about the “Hero’s Journey” that involves four distinct parts: Separation, Initiation, Change and Return. This pattern can be observed in everything from Shakespeare classics to Disney films and even in your own life – especially if you are a person in recovery. What did things look like before the hero was called away? For me, it was a scene of hectic over-achieving, each exhausting day ending with a heavy dose of white wine to reward and numb myself. For some, it is a time of dysfunction and humiliation. For others, a silent descent that is painfully unnoticed. What was the opening scene for your personal hero’s journey? If you are still drinking but contemplating recovery, this scene opens on you now, today. Right here, reading this post. You set down your mug and lean forward toward the screen. You’ve heard the call. Your journey is about to begin. In some cases, this scene is literal: sequestered in a detox or rehab facility; retreating to the mountains to sweat it out alone; locking the door and hiding from the world. For many others, myself included, this was a time of internal separation. I was physically present but mentally became “other” than those around me. A new set of unfamiliar circumstances (physical or emotional) is forced upon the hero, who must adapt and navigate in order to survive. Difficulties arise. For a Recovery Hero, this can be the physical hardships of detox, the fall-out from personal dysfunction such as financial strains, relationship breakdowns, or career challenges. Consequences must be faced so a new order can emerge. Often in this part of the journey, new relationships are formed. These characters will be markedly different from those in the opening scene, bringing delightful new insights. Buzz Lightyear. Hans Solo. Mr. Darcy. In real-life recovery, these “impact characters” loom large and play a vital role. They can be others at a recovery meeting. A relative with long-term sobriety. A sponsor, therapist or mentor. A supportive friend who rejects shame and stigma. The initiation period can feel prolonged for the recovering alcoholic encountering many sober “firsts”; first sober wedding, first sober Christmas party, first sober convention, first sober vacation. Since events happen occasionally, it can take a few years for the purpose of the initiation to be fulfilled. That purpose is revealed in the next scene. The changes the hero experiences as a result of initiations are revealed in this act. This is narrated by harkening back to a problem or situation from the opening scene. The audience realizes that the hero has not only overcome hardships and obstacles, but has a new perspective or understanding as a result. It’s implied that this change is far-reaching and emotions swell (cue orchestra!) as we anticipate the impact this will have on the hero’s previous life. Here we glimpse the long-anticipated resolutions from the journey and the benefits of the resulting changes. The sufferings or consequences of the opening scene are addressed and the improved circumstances are revealed. Life is better. The future is hopeful. It is my duty to add a word on tragedy. Tragedy ensues if the hero does not make those positive changes or uses free will to make the wrong choice. Usually there is a great loss as a result – of fortune, love or life (think Othello, King Lear, Romeo and Juliette). In the recovery parallel, tragic events occur when someone just can’t conquer their addiction. It is heartbreaking for anyone to continue to live a life of suffering or to die as a result of the disease; to abandon the heroic journey of recovery before the process is complete, giving up on the hope of overcoming addiction. Don’t be shy about casting yourself into this play. Visualize the blockbuster, feel-good narrative you are creating. It is your story. You own it, you write it every day. It is never too late to change directions, rewrite a chapter, or add a sequel. My wish for you is a happy ending. Love❣You are a gifted writer! Thank you! Love this post! It so happens to have been written on my 50th birdday(a family thing) and was my 2nd day sober:) You have such a gift for writing. Have been reading your posts in order. Best sober blog out there! You are a brave and honest person. The fact that you use this blog to show accountability is admirable.Very few people would do that. hi yes I fought the battle with drug addiction, hepatitis c and anorexia and have been winning now for round 6 years, had a couple of backsteps along my journey but have been cleared through the pegasus programme of the hepatitis and the need to use. I am still a diagnosed depressive with a suicidal past but my words are my therapy and I hope to one day be medication free. I am 44 yrs old and have slowly gained my power back. Reblogged this on saserejoshua's Blog. Reblogged this on The Journey To Me. Separation, Initiation, Change and Return – I think this could cover both business and personal life. In Archetypal psych. that’s exactly how we view things~ this is a myth that we live out in all aspects of our lives. Only we tend to focus on ‘wrestling’ ogres and dragons rather than ‘chopping heads off’ ~:-) We acknowledge and accept our Shadows; that the sun must set. write yourself into your own story. excellent post. We need more like you to put things how they are! The problem with ‘recovery’ today is that not all of us can,(especially where Mental health is at hand) therefore we are subject to continuous abuse from government reforms and NHS target maniacs that ultimately make us worse!! Many thanks for sharing this. Wonderful~ I have friends in Recovery, and a cluster of students learning how to be there in ways that enable, support, and encourage Those Heroes. You have drawn comments from a lot of different readers for a lot of different reasons, and that spells success to me. Whatever it is you are doing, it’s working, and I think it’s helping people. So keep it up, stay strong, and God bless. I like your writing style and its positive outlook. There’s no way to self-improve or change if we do not retreat and take some hibernating time to understand ourselves and become more able to connect with our inner weaknesses and skills. Then join to a journey of challenging experiences and bitter experiences included make ourselves stronger but at the same time able to overturn any difficulties. Aiming to many mini goals and using experience to solve any situations since life becomes a game. Well this is my impression of what you wrote from my point of view. Thanks for you interesting post. Added you to my reader lists and going to check your other posts. This is very profound and touched me deeply. Thank you so much. I sat my coffee mug down, nursing a terrible hangover, and realizing this is it. I started the journey, made it 30 days and had let it go. This is such a profound post. Hopefully you don’t mind that i repost. Nicely put! Of course life twists and turns and “scenes” can get re-ordered or re-run, sometimes with the same cast, sometimes with a few changes, sometimes with a complete change except for oneself. But let’s hope for a “and they lived happily ever after”! Awesome post! Can definitely relate to what you wrote. Just wish I had acknowledged this prior to my wife leaving! Quit drinking 11 weeks ago. Already have had a few firsts bring sober. Great post! Reblogged this on jnewworld's Blog. Hope my happy ending is restoration of my relationship! At the end you discover a lightness and a beauty in life which is here, no matter how you behave. Simething, inside has deeply changed. Think addiction has a face? You cannot see addiction as it knows no color, income level, profession, or religion. To face the darkest part of oneself means admitting we all have a deeper part of ourselves, we may not know, much less like. But to face the dark in order to turn on the light and then to share it with others takes more courage and character than any degree can ever hope to obtain. Very nice post. I know you applied this to drinking, but this would also be 100% appropriate for those suffering from mental health issues (i.e. bi-polar). Yes, you are absolutely right. Or cancer, divorce, so many trial we go through. So many hard things that shape out stories and define our character. Yes, the caption was super powerful! Thank you for being a hero, our hero! We need more of you, fighting the good fight! Reblogged this on Slightly Left of Centre. Thanks for sharing my post with your readers. Much appreciated! Reblogged this on Irfan Hamid. This is quite moving. I have never thought about my life story in this way before. It’s a good perspective, I like it. Thank you for sharing! Aw I liked this post very thoughtful! Reblogged this on I'm LissaBreen – Welcome To My World (My Life, My Way&My Destiny). I LOVE THIS! Am now a follower and I am going to share this on my Facebook page. This is a post I wish I could like 1 million times! I’m contemplating liking and I un-liking it 1 million and 1 times! What a unique way to look at sobriety in any form! Thanks so much for your post! I went through the first two stages repeatedly so many times, but once I found that one person that made it worth changing, it was all up from there. 18 months sober so far. Thank you for your post. Great post. As someone in recovery, I’ve heard our journey explained lots of different ways, but never quite like this. Very creative! Fantastic. What’s the biggest lesson so far? “If you are still drinking but contemplating recovery, this scene opens on you now, today. Right here, reading this post. You set down your mug and lean forward towards the screen. You have heard the call. Your journey is about to begin.” — AGAIN!! YES, I HEARD EVERY WORD. I GET IT. FANTASTIC WRITING AND INSPIRATION. THANK YOU. Awesome Lala – keep us posted on your adventures in recovery! Fantastic post. We all have it in us to be our own heroes. Amazing. You win the internet today. Excellent post! This is an incredibly brave post! I don’t think I’d have the strength to come out and admit I have an issue such as alcoholism. I think you’ll reach many people with these posts and my hat’s off to you to be strong enough to share. really enjoying this project of you posting so often! I started drinking on my 18th birthday. My sister’s husband found it funny to put some type of alcohol in my pop. I threw up profusely that afternoon. That was the beginning. What happened next? And how are you now? This is so great! I’d never heard the breakdown before, but love how neatly it applies to recovery. ‘Don’t quit before the miracle happens’ comes to mind. I love happy endings. Nothing makes me feel better than seeing the hero overcome, the girl get the guy or the miracle cure at the last second. Who knew I could write my own happy ending? Because that is what I am doing. My sad, bleak tragedy has taken a big turn for the better and I plan to continue on the happy, sober journey of self discovery for the rest of my days. Wearing my Wonder Woman suit whenever necessary. Thanks for the though provoking post! I look forward to tomorrow! Great writing! I am in the separation stage…just beginning. You really could expand on each of these stages too. Book? 🙂 Have you read the book “Wild” by Cheryl Strayed? You might enjoy her writing. Excellent book. I went to her book signing a couple weeks ago. She has been part of my decision to quit drinking too. My experience and ideas on living a adventurous, healthy sober life. sit down. let me tell you a story about ohmygod what am I doing? a creative outlet + nonlinear collection of musings on unlearning how to destroy and remembering how to create. designed to enlighten, empower and humor. who knew life would be better??? ?